Speed, it seems to me, is not taken too seriously by motorcyclists. Well, what I mean to say is that drivers of any kind of vehicle seem not to understand just how important small speed differences are. Cash and I were talking the other day and I discovered what I think is a common misunderstanding relative to speed and I want, here, to examine what that misunderstanding is and why it exists. Mostly, however, I want our readers to fully understand that a small speed difference is not a trivial matter as it can mean the difference between life and death. When we are riding it is very normal for us to be traveling at just OVER the speed limit. Sometimes as much as 10 mph over the limit, usually closer to 5 mph over, but in any event, consistent with the traffic around us. My guess is that you do the same. Cash's contention is that so long as there is a very low chance of cross traffic or an accident ahead, it makes almost no difference how fast we are moving relative to the speed limit so long as we are close to it. Instead, she argues, her concern is with our speeds when we are coming to a stop in an aggressive manner - such as when we must avoid a wandering deer ahead of us. I fully agree with her. But I wanted to see if she understood just how big a deal it is to be riding just a little over the speed limit when it comes to that emergency stop. Some of you know that I was recently involved in a court case where a woman motorcyclist died when she collided with a car when she was moving at only 18 mph. Eighteen Miles Per Hour! I asked Cash if the speed limit was 60 mph and we were traveling at 60 mph, did she know that we could come to a complete stop in almost exactly 150 feet. (Assuming we could achieve a deceleration rate of 0.8g's.) She said that she didn't know the number but that sounded about right. I then said that if a deer was 150 feet ahead of her when she began braking, clearly she would not collide with that deer, but if she had been traveling at 65 mph when she began braking, then certainly she would hit it (if it did not get out of the way), and she again agreed. Then I asked her how fast the collision speed would be in that case. Her answer was probably close to what your own answer would be: somewhere between 5 and 10 mph. You would probably survive a collision at such low speeds. But as it turns out, she was very wrong in her guess. In fact, she would hit that deer at a speed of 25 mph. Twenty-five Miles Per Hour! The problem in her perspective, and probably yours, is the tendency to think in linear terms. For example, let's look at a graph that shows how long it takes to stop your motorcycle starting at various speeds and again assuming a deceleration rate of 0.8g's. Observe, please, that the blue line shows that you can come to a complete stop from a speed of 30 mph in 1.70 seconds. Then notice that if we double the speed to 60 mph, the green line, that it takes you exactly twice as long to stop (3.40 seconds). 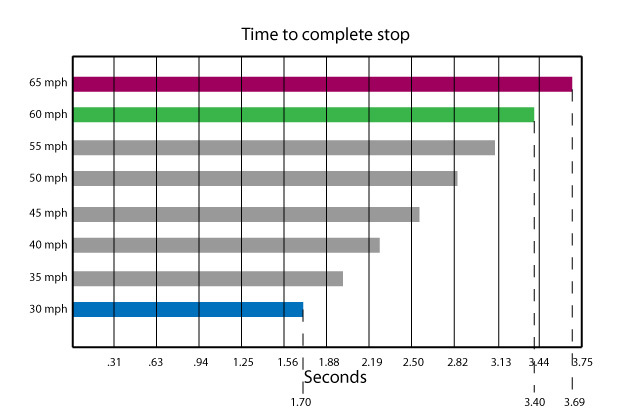 There is clearly a linear relationship between time to stop and speed. 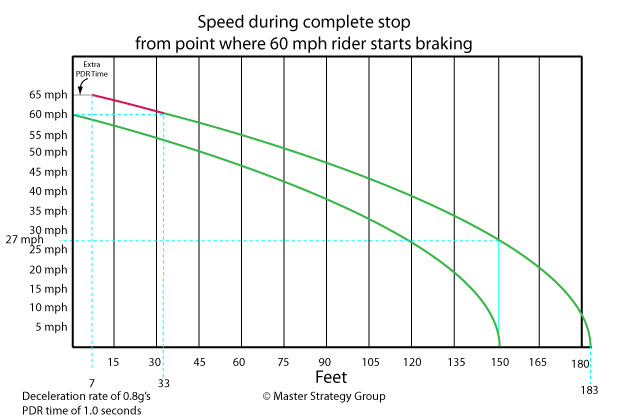 But now let's look at stopping distance versus speed. Here we observe that it takes 37.5 feet to come to a complete stop starting at 30 mph, but if we double the starting speed to 60 mph, it takes FOUR times as much distance to come to a complete stop (150 feet) instead of twice (75 feet). Obviously, stopping distance is NOT a linear function. Instead, it varies with the SQUARE of your speed. Why? Because when you double the speed you increase the kinetic energy of the moving vehicle by the square of that increase - and all of that kinetic energy must be scrubbed (converted to heat) by your brakes. Now observe from the two diagrams above that by increasing our starting speed by only 5 mph to 65 instead of 60, it takes us only 1 quarter of a second longer to stop, actually 0.29 seconds, but in that quarter of a second we traveled an extra 26 feet! Since as we brake from 65 mph to zero mph we must pass through 60 mph, there can be no difference in the stopping time nor distance to stop between the last 60 mph starting at 65 and the entire graph starting from 60 mph. 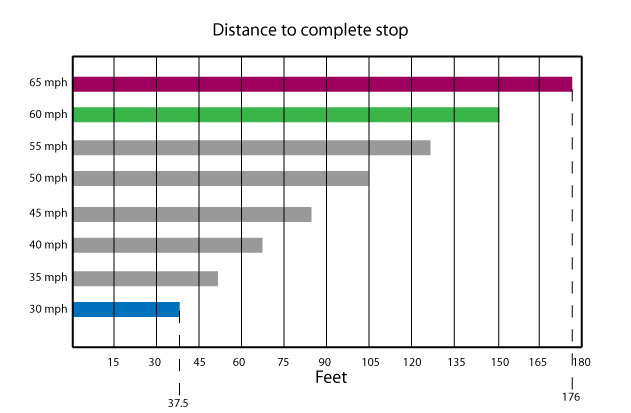 Therefore, that extra 26 feet of stopping distance came at the beginning of our braking effort, not at the end of it. This should also be obvious from the fact that we see that we can scrub a full 30 mph in just 37.5 feet while it takes us an additional 26 feet of stopping distance to scrub just 5 mph from a starting speed of 65 mph. So let's now look at how fast you are traveling while decelerating from 60 mph and from 65 mph. We can see that the green portion of the speed curves is identical, of course, because they show the deceleration from 60 mph to zero in both curves. 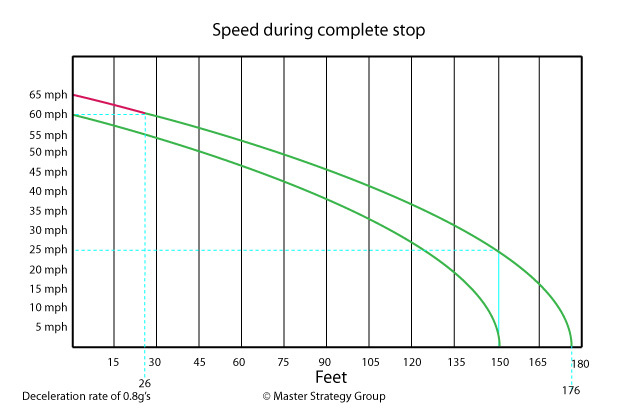 The red portion of the top curve shows that the only difference, in terms of speed and distance between stopping from 65 mph and 60 mph is 26 feet and 5 mph and that it happens at the start of deceleration, not at the end. Now we look at the bottom right of the chart and we see that when stopping from 65 mph we are traveling at 25 mph when we have crossed the 150 foot mark. That is, we would collide with the deer at 25 MPH if we began braking at 65 mph at a distance of 150 feet from it. Now you see why that 'trivial' 5 mph of extra speed is not so trivial after all. It can kill you. Now some of you techie types will claim that the actual collision speed will be considerably higher than my chart shows because if both vehicles noticed a threat at the same time, and if both drivers take the same amount of time to Perceive the threat, Decide what to do about it, and React (PDR), then the faster moving vehicle will travel farther before its brakes are applied. It will surprise you to learn that delayed start of braking because of PDR time is trivial compared to that extra 5 mph of starting speed we discussed. Here is a new chart to demonstrate that. Delaying the start of braking by 7 feet for the vehicle traveling at 65 mph results in a collision speed of 27 mph instead of 25 mph.